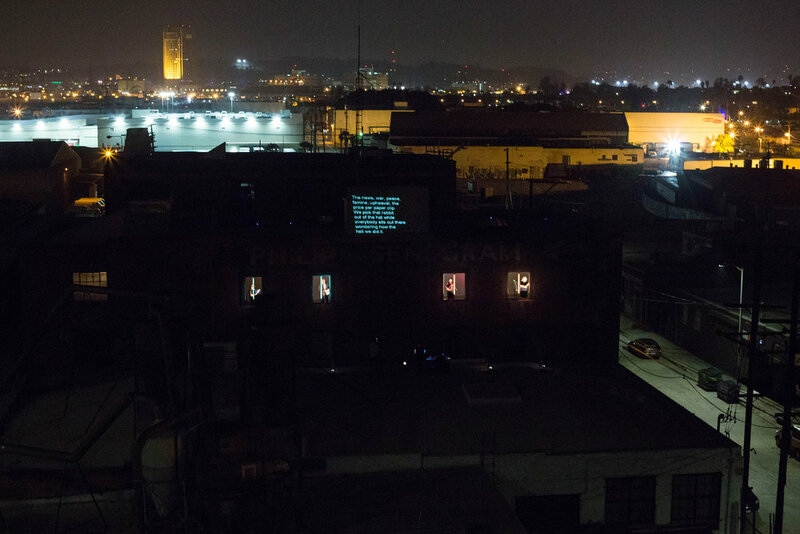 A Sublime Madness in the Soul was presented through the windows of the artist’s then-studio on Anderson Street in downtown Los Angeles, and was visible and audible from the Sixth Street Bridge, which the studio overlooked. Opera singer/artist Juliana Snapper composed and musically directed a score for vocals from a libretto Silton compiled for four vocalists. The text recombines excerpts from American films including Wall Street, The Great Dictator, Do the Right Thing, Boiler Room, Network, Walkout, Citizen Kane, Real Women Have Curves, The Wolf of Wall Street, Trading Places, CHE, The Color of Money, and It's a Wonderful Life. 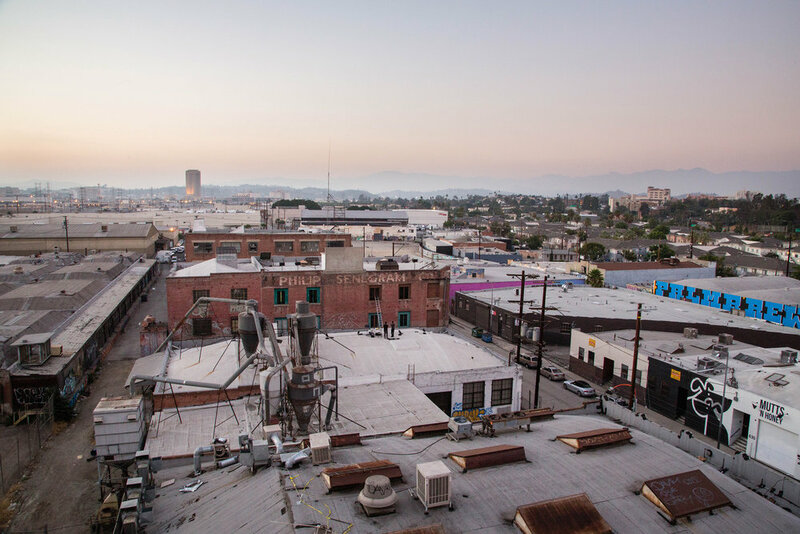 The piece was organized with some urgency in response to rapidly changing leasing conditions for artists and others working in the eastern downtown Los Angeles landscape. The studio building that Silton had occupied for a decade prior had recently been sold. Property owners, developers, investors, and collectors eager to capitalize on an ever-expanding art market had been rapidly driving up property values and driving out long-term tenants. This cycle of displacement in industrial and residential areas, rooted in capital, repeats throughout history, but seemingly with increasing vengeance and unabashed entitlement. In addition to marked economic changes in the area surrounding Silton’s studio, the structurally untenable bridge had been slated for demolition and replacement. The title for the performance is taken from American theologian Reinhold Niebuhr (1892-1971) who suggested that the hunger for “perfect justice” can generate or resemble a “sublime madness in the soul,” and that such madness is imperative to sustaining hope. Silton credits progressive journalist/activist Chris Hedges (Truthdig.org, Wages of Rebellion: The Moral Imperative of Revolt, 2015) with invoking ideas articulated by Niebuhr in recent interviews. The performance was presented twice in one evening. Marking the beginning of each were musical sets that struck a conceptual tone for the performance to come; two musicians joined from opposite sides of the bridge in advance of each performance (functioning themselves as a kind of musical bridge) and played a series of songs including Brother Can You Spare a Dime?, We’re in the Money, and Wayfaring Stranger—initially recognizable and then trailing into abstraction. 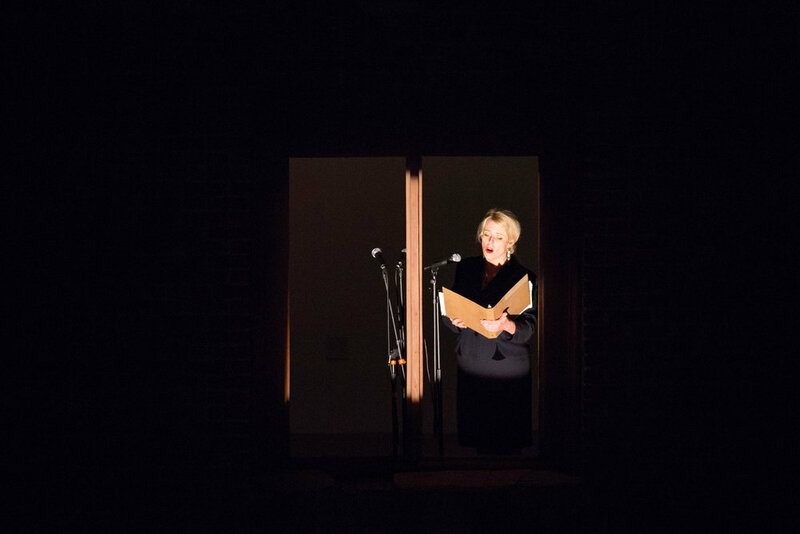 The libretto was projected just above the windows. A SUBLIME MADNESS IN THE SOUL uses site and the operatic voice to respond to a set of conditions. It is at once swan song and social document.